A signed waiver must be completed by all participants who wish to jump. If you are under the age of 18, the waiver must be completed by your parent, a legal guardian or a consenting responsible adult. It is highly recommended that you book online in advance as we cannot guarantee how busy the park will be. Please ensure you arrive 30 minutes before your pre-booked time slot to allow time for the compulsory safety briefing. Airea51 grip socks must be worn at all times when on the trampolines. These are available to purchase for £2.00 at reception. Once purchased they are yours to keep and can be used as many times as you like. We do not accept socks purchased from other trampoline parks. These terms and conditions apply to the entry for Airea51 and the use of all activities within the facilities. By purchasing entry at Airea51 or using any of the facility, the participant agrees to be bound by these conditions. Airea51 reserves the right to make any changes to the activities, without notice. Whether to conform to safety requirements or for any other reason. Any person using Airea51’s facilities must complete a waiver or have one completed on their behalf. Those under the age of 18 or any participant without the capability to complete their own waiver must ensure a legal guardian has completed one on their behalf. Children must be at least 5 years of age to use the facilities. Any child under the age of 5 must be accompanied by a consenting responsible adult. (Unless participating in a dedicated pre-school club i.e. soft play, budding ballerinas). Any person causing intentional damage to the facilities will be liable to pay for any modifications needed. If damage is caused by a member from a group/party booking, the hirer will be liable to pay for the modifications of any damage (including accidental) caused by anyone attending the group/party booking. Airea51 reserves the right to refuse admission to anyone who is believed to be under the influence of drugs or alcohol. Along with anyone who is believed to engage in antisocial or unsafe behaviour. On the basis of health and safety Airea51 reserves the right to refuse entry to late arrivals. You must advise Airea51 as soon as possible of any mistake made in the booking confirmation. We will endeavour to ensure that your party commences at the time booked and it shall be the responsibility of each participant to ensure they arrive on time. Late arrivals maybe refused to undertake the activities and no refunds or compensation will be payable in such circumstances. Party booking 50% deposit must be paid in order to secure the party. Remaining balance must be paid 1 week before the party date. Only special offers available at the time of booking and agreed with Airea51 can be applied to a booking. No cancellations allowed to take advantage of future special offers. You are required to arrive 30 minutes prior to the confirmed time, to complete any necessary paperwork and allow enough time to watch the Airea51 safety brief. Minimum of 10 guests for every party. If the numbers of guests drop below the minimum of 10, then the customer will still be required to pay for 10 guests. All party food orders must go through airea51. Only food purchased through airea51 will be allowed. If any member of the group has any dietary requirements, we need to be advised no later than 7 days before the party/group booking. We will do our best to cater for everyone’s needs. Participation at airea51 is done so at your own risk and serious misuse could be fatal. 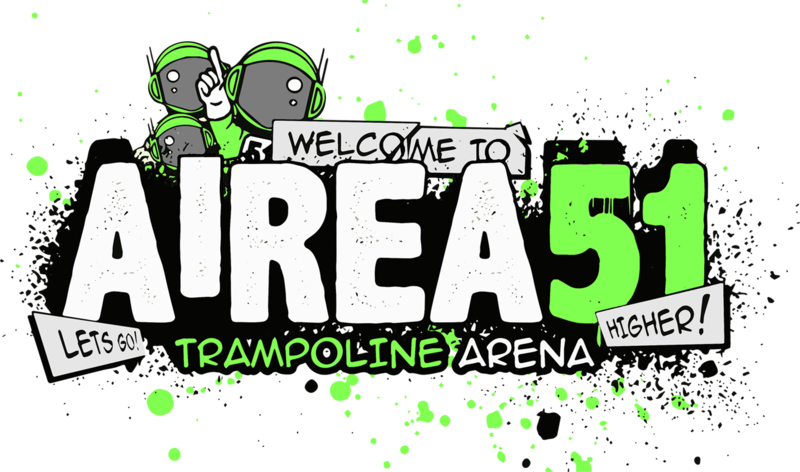 It is compulsory that all participants attend a safety briefing video from an airea51 court marshal prior to every jumping session on the trampolines. Airea51 reserves the right to remove a participant from the facility should it be deemed necessary to do so. This includes a participant who does not comply with the safety rules and advice from our court marshals. The decision of the Manager on duty will be final. After the safety briefing, participants will not be individually supervised by a court marshal in the facility. You as parents, legal guardians or responsible adults (whether participating or spectating) must sign a risk acknowledgment disclaimer stating you will accept responsibility for the safety and supervision of the child in your care. For any child 12 years of age or under, a responsible adult must remain on site within the facility. All participants are to jump within their own ability. If participants have any medical concerns, they are advised to consult their doctor in advance. Participants are to be courteous, and respect other jumpers around them. Food, drink, and chewing gum are prohibited at all times on the trampolines. All belts, jewellery or other sharp items of clothing should be removed before entering the trampolines. All payments should be made at the time of booking. Payments can be made by either debit or credit card online or at the facility. Airea51 reserves the right to change its prices at any time. As much notice as possible will be given if such change occurs. Airea 51 requires 48 hours notice before the booked session start time to provide a credit note for any cancellations for bookings fewer than 9 jumpers. Airea51 requires 14 clear days notice to provide a refund for any cancellations for parties or any group bookings for 10 jumpers or more. Any cancellations occurring with less than 14 days notice yet more than 7 clear days notice will be offered a transfer to another date and time or a credit note for the value of the booking. This requires the participant to specify an alternative date and time for their booking. With less than 7 days notice all cancellations will not receive a refund or transfer. Airea51 shall be entitled to cancel your booking at any time. In the event that Airea51 decides to cancel your booking it shall use its reasonable endeavours to notify you as soon as possible. You shall be entitled to a full refund in the event of cancellation under this clause but no other compensation shall be payable.In the event that it proves necessary to close the Activities for reasons beyond the control of AIREA51 and in circumstances where your party has commenced participation in the Activities, you shall not be entitled to any refund (in part or in whole). In such circumstances AIREA51 may, but shall not be obliged to, offer alternative dates or times at reduced rates.Payments made by debit or credit card will be refunded to the same card. No refunds will be given for transactions made by gift vouchers. Bookings may be transferred in adherence with our transfer policy.Where multiple forms of payment are used, AIREA51 reserves the right to refund any monies due on a refund or amendment by debit or credit card. Airea51 will not offer a refund or transfer of tickets due to extreme weather conditions. 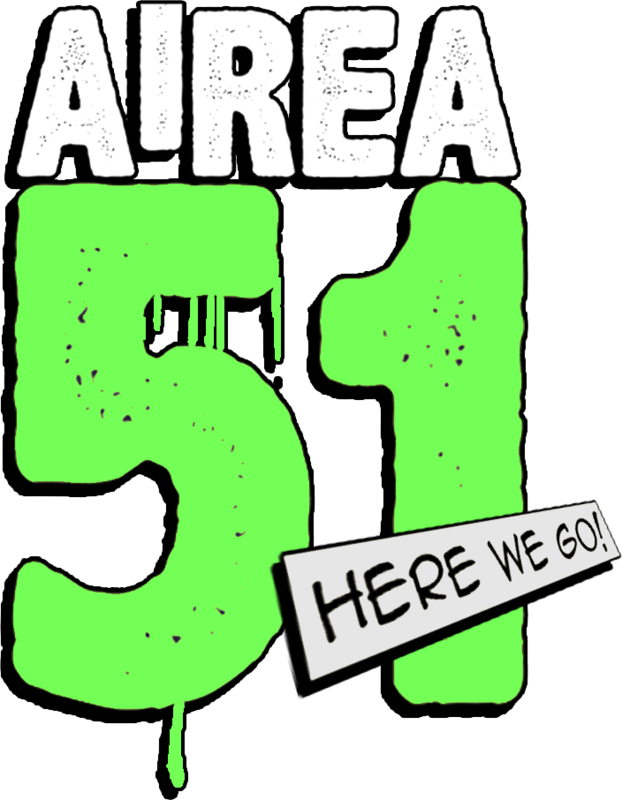 Airea51 does not accept responsibility for the loss of property or theft arising from the use of the facilities. Money or valuables should therefore, not be left unattended. On site lockers are available and can be used to store valuables. This includes vehicles in surrounding car parks or parked on neighbouring roads. Vehicles and their contents are left at their owner’s risk. Airea51, its employees and directors are not liable to you, for personal injury or death suffered by the participant from negligence. Whilst using airea51 facilities, you consent and agree to the use of CCTV for health and safety and security purposes. The consent is also to images and videos being taken for advertising and promotional purposes of yourself, your children or children whom you are responsible for.